The White Circus is almost known as much for the elite ski racers who compete on the World Cup tour as it is for its rabid fan base. 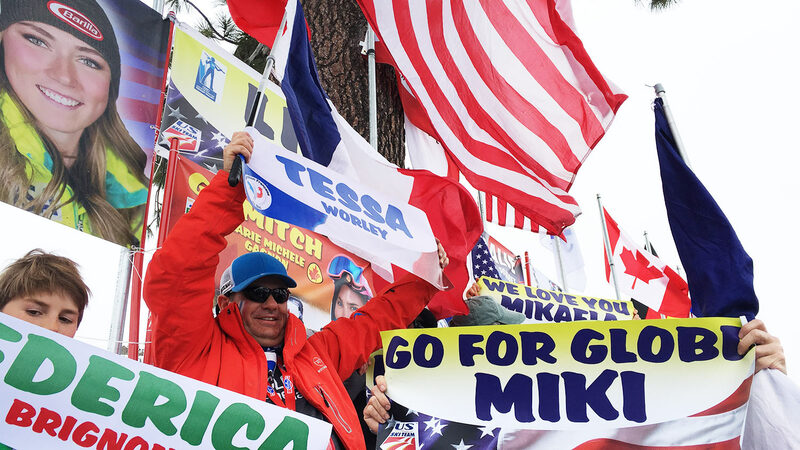 To show up and cheer for your favorite skier is one thing. But to fly overseas with homemade posters and an entourage—like Lionel Agoutin, from France—is quite another. Agoutin is easy to spot in a large crowd. Just look for the man with French flags painted on his cheeks who is waving one of his custom-made posters and cheering loudly in a heavy accent. At Squaw, I found him hanging posters at the top of the grandstand and in the trees. 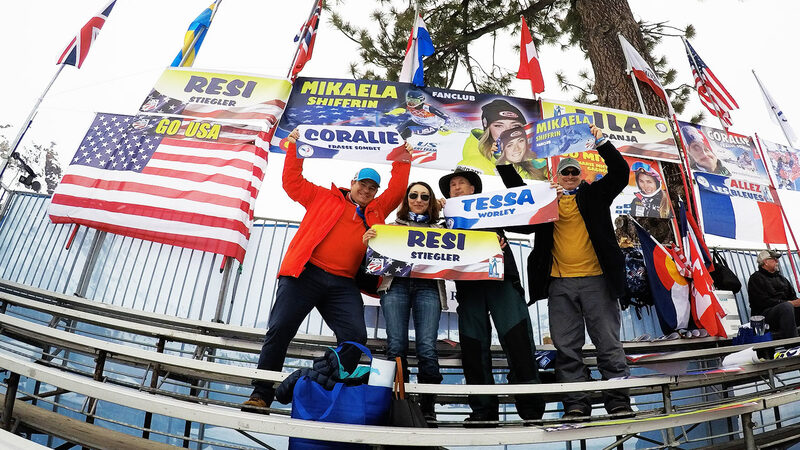 The signs were made specifically for the skiers who would be competing over the weekend: Marie-Michèle Gagnon (CAN), Tessa Worley (FRA), Federica Brignone (ITA), and Mikaela Shiffrin (USA), to name a few. Each banner was emblazoned with the athletes' name and headshot, framed by their nation's symbols, colors, and flag. Agoutin designed and printed each one—all to show support for the athletes and their families. And for each racer, he handed out several more banners to surrounding spectators, opening his cheering section to any willing fan. "The goal is to share emotion with all the fans from all the teams from all around the world, and bring them to the race, be happy, to share and to feel emotion with the racers. Whatever racer, whatever the nation. We always have fun and happiness," says Agoutin. When did you become a World Cup fan? Agoutin: I've been a big fan for many years. But at the beginning, my daughter was racing as well. She was born the same year as Lindsey Vonn. And she started for the championship in France. At 30 years old, she got a problem with her knee and she couldn't go anymore to the race. She asked me to go to follow Lindsey Vonn all around the world. …I decided to make a lot of banners for all the teams, and that is why I am here. Because all the time, I feel emotion and the people are friendly. All the time they want to share their emotion with the people here. It's fun. That's all. How do you make the posters? My brother-in-law is a designer, so he taught me and I learned how to make the posters, how to create the posters, the design, how to make the design beautiful. I can make any banner now in less than five minutes. Why do you make the posters? If we look at the people who are the fans, if you compare with football and all the sports that are popular, ski racing is supposed to be the most interesting. Each banner has a name, a name is media, and media is like support. With support they have more money, they have more training, and then they may win. The goal is that we have to show the world that each time we have a racer on the slope, we must have the name on the grandstand. And [the athletes] really appreciate that. 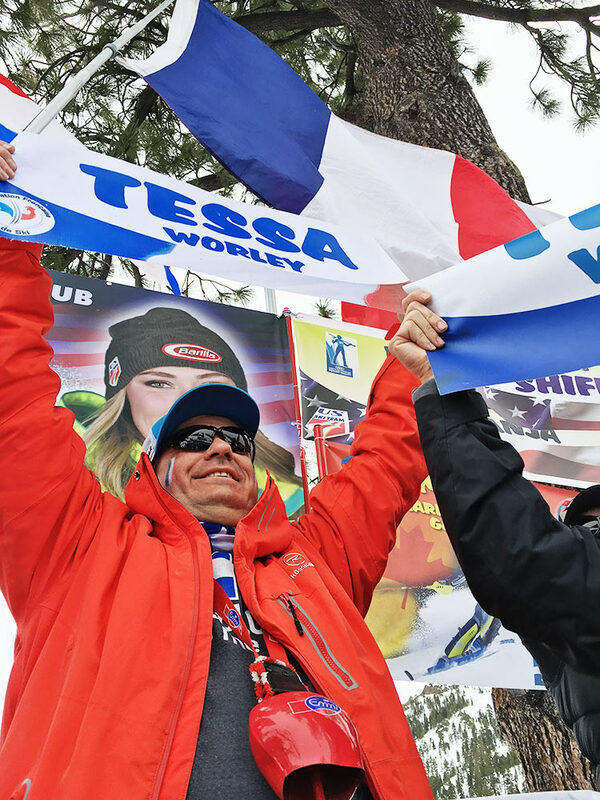 How many World Cup races have you been to? This is my 13th World Cup. Last year, 15. The previous year, 12. I have been following the World Cup like this for the last four years. Yeah, it's amazing. I live my dream. I always have another dream. I always have another goal. Like today, here in Squaw Valley—I met Travis [Ganong] and Mich [Marie-Michele Gagnon] together in Méribel [France] for the final in 2015. We had food together in the chalet with the sponsors, and it was very, very funny because they said, 'Oh Lionel, you have to go to Squaw Valley, visit Lake Tahoe.' And God was very funny with me and offered me the possibility to come here, and fortunately with a race. I live my dream. I don't care about the money. I don't care about how much it costs. This is a short time in my life. Are Americans good World Cup fans? This is very important to say and to share: American fans, they're exactly the same as the European, and if you look here now, at a women's race, there would be more than 10,000 people here [in Europe], and it is exactly the same in the U.S. And probably more exciting than the French.